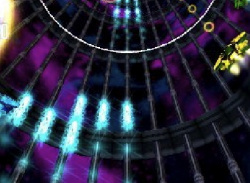 Will you master the warp gate or lose it all in this technoplasma fuelled shooter? 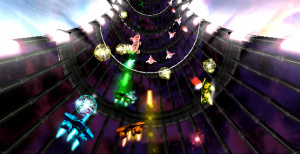 Gyrostarr challenges you and up to three additional players to pilot your ships through a series of twisting, turning technoplasma tracks while battling a variety of deadly alien foes at ever-increasing speeds. 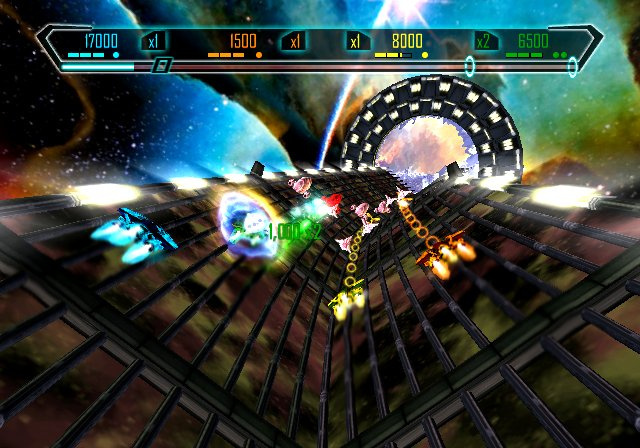 While fighting and maneuvering, you must collect enough energy to activate the ancient warpgate at the end of each track. Succeed, and you can journey to the next, even deadlier track. Fail, and the gate will slam shut, destroying your ship. 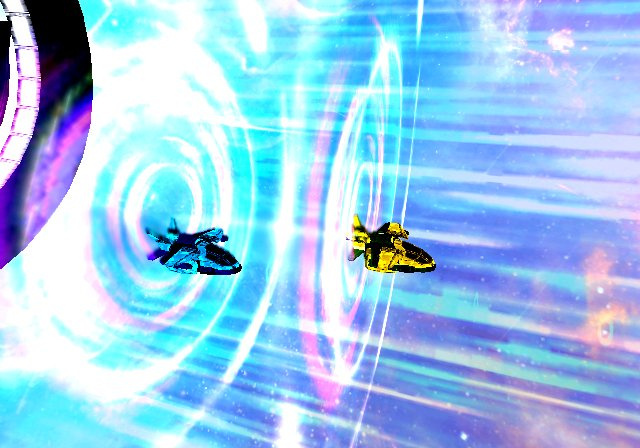 Enhance your ship with weapon pickups, coordinate attacks with your friends to fire powerful combined blasts and use your grapple to snag energy and pickups in the midst of combat. Control your ship with the Wii Remote controller, Nunchuk controller or Classic Controller, or use the "paired" control system that allows two players to use a connected Wii Remote and Nunchuk or Classic Controller at the same time. 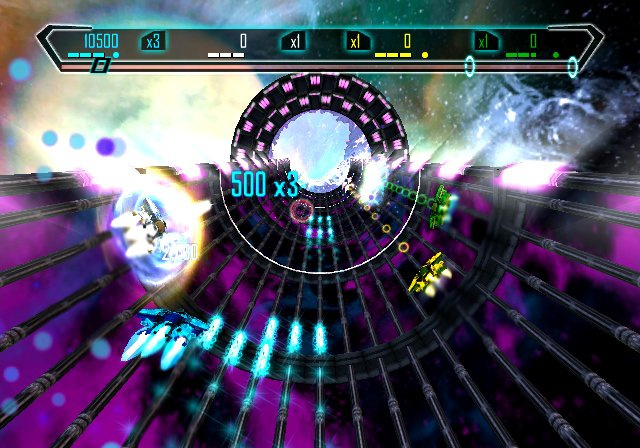 Offering 50 levels of intense action, powerful pickups, high-speed bonus levels and mayhem for up to four players, Gyrostarr is a killer arcade challenge. 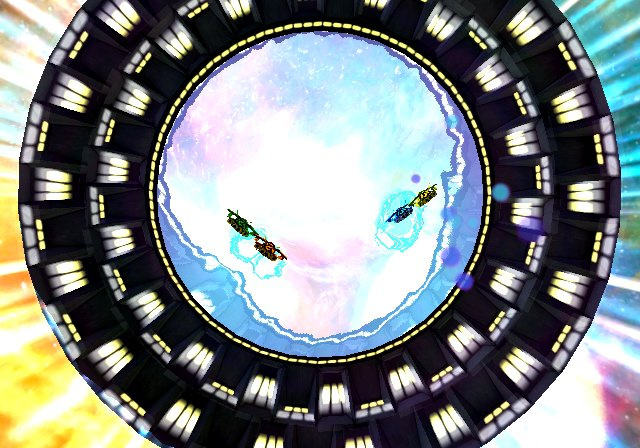 Reminds me a lot of F-Zero in terms of the visuals and music, but the way you play certainly seems unique. 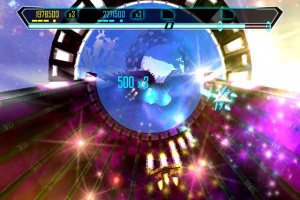 This looks awsome, graphics remind me of geometry wars. Like others have said this does look like a mashup of F-zero & Tempest type gameplay. Very good. I think it'd possibly be cool too to bring back Mach Rider. Looks pretty good. I wonder whether it will be controlled via the pointer, or more traditionally? 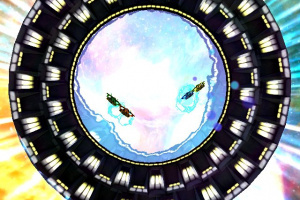 The ship movement seems a bit wobbly in the trailer, so it might be pointer-based. After watching that video this will be the first WiiWare game I buy (if it is a launch, it better). I love flight shooters, and this looks great single or multiplayer. Wikipedia's list of Wiiware games says this will be out at launch for North America. And I am supposed to believe wikipedia b/c? I heard on a podcast from people that actually know something is that it will be out a few weeks after launch. I'll go with that over wiki.... that site is so inaccurate. Anyway, I want the game NOW! 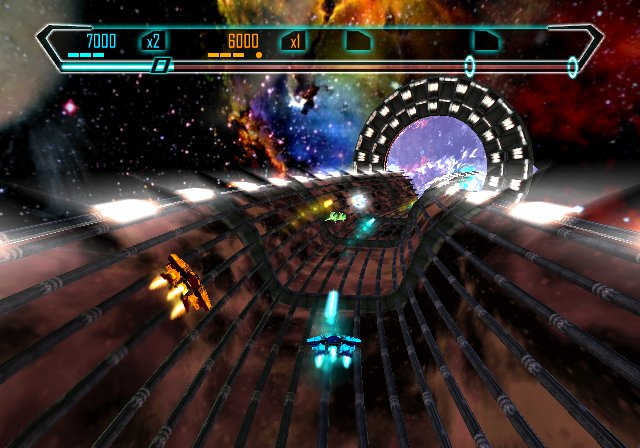 If F-Zero became a shooter, it would look like this game. The video looks promising but I would love to see more clips of gameplay. 700 pts? (what it says) Gotta grab me this Hope that it doesnt get stale after a few levels...but the art is cool. Hope it has online leaderboards and drop in/out multplayer! Can't wait for it to come out next week. I'm getting it over Star Soldier R. Seems to have more depth for the same price. And I thought it was 800? Did I hear wrong? Gyrostar costs 700 points and Star Soldier R costs 800 points. Oh, well this just made things more interesting for me. I've bene planning out my purchases, considering point values and I planned everything considering Gyrostarr was 800. This is good. Thanks for the verificiation. I found the release date for this game for the wiiware at the IGN website and here it is and hope its true and the real final date too... check the link below too and it says it all. @19: IGN Lies so much. Its fake trust me. Yep. They keep saying it's one date then they keep bumping it back (for WiiWare specifically). It's not reliable at all. I really hope Gyrostarr's coming real soon, though. 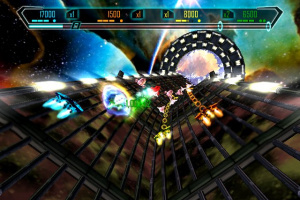 Gyrostarr is my second-most anticipated WiiWare title, after Plattchen. I can't wait! It's been rated by the ESRB so I expect June 2nd and if Toki Tori/Helix makes the cut instead, then June 9th, hopefully. Man, this looks sick! I'm looking forward to this one! Talk about eye candy! This should be a great title. If it plays half as good as it looks, we're all in for quite a treat with this one. Guys, this will come to us around June 16th if not sooner (let's hope for sooner!). IGN's lastest podcast reveals that Gyrostarr is now "in Nintendo's hands" so it's just a matter of having them release it on the service. They'll release it sooner if they see more motivation to do so (i.e., people really want it to appear). I think I've found my first shooter. Seriuosly this game looks trippy. just wondering...how do u make a picture on your username for WWW? yes, we Americans are very lucky . i am greatly looking forward to this. i hope it plays well. i will try to buy it the day it gets releases if it is possible. I hope this game comes out next week or this month. I have been wanting this title ever since I seen it a couple of months ago. This still looks like the best shooter for wiiware so far, and it isn't even released yet! it is like Tempest, yet, there are several differences. this game is a completely different experience from Tempest. and i bet it is more fun. Looks like that May release was total BS. Well my birthday is June 29, I sure hope it comes out before or at least that week. Though if that Earthbound thing was true, that's all I'll need for a good long while. I sent an e-mail to nintendo recently, and suggest you all do as well requesting this game asap. I got a reply rather quickly, but it didnt really say anything, thought I would post their reply here. never know what the future holds! (http://www.nintendo.com/whatsnew) for the latest information and announcements. Now that looks awesome, too bad no release date yet. mjordan: Sounds like an automated message, honestly. Or at least one they have automatically typed up. As in, replace "Gyrostarr for WiiWare" with something like "Starfox for Wii" or "F-Zero for Wii" and you'll see you'll probably get the same thing. Come on Nintendo. Can't you say how badly most of us want this game!! This game is gonna be AWESOME!!! oh yeah, I assumed it to be a form e-mail, just thought I would share. I think this game will come out next week, or the first week of July the latest. Somehow, I don't think this is Nintendo's fault that it's that it's not here yet, and even if it is, I'm sure they have a good reason for it. I think the best thing to do right now is just trust that it will come out when it comes out and focus on something else. That's how I've gotten through the wait so far, and it's working very well. I haven't tested it on other people though, so if you do try it, tell me if it works or not so I can gauge it's effectiveness, I'll be waiting. That approach kinda works with VC, if only because I have NO expectations for it anymore bu with Wiiware, I expect at least 1 must-have game in a 2 week period. When Gyrostarr, etc. is done but theyu relase a fishing, bouncing ball, and Pokemon Do nothing game, then it is #$%^&* annoying. Plattchen? I guess. What would be even better is if our 1 VC game was one everyone was waiting for...hint hint...any of those 3 will do, Ninty! Anyway, i plan to get this...just gotta delete Nin Chan and maybe Net Chan. Definite buy, and 700 Wii points... (Eye's turn into dollar signs and a cash register can be heard in the distance). I love when games like these come out - lets you know what old games still have the ol' cache... Qix fared miserably. Will Tempest do better? I think so. Will this game satisfy the Tempest fans? Or will it have to be re-named into Gyros-starr? Yah, I see what you mean, now that you mention it. Oh well, it's coming out this Monday anyway, now lets just hope we get that one VC game everyone wants. Hmmm...maybe we should try Tony's method? I don't want Earthbound!!! I hope its resolved soon because I'm gonna have to delete vip casino blackjack and pop to make room for it. As for the storage issue, I haven't even d/l a VC or WiiWare game yet and I'm under 900 blocks left. It's ridiculous. I do have at least Dr. Mario RX demo to dump, seeing as my friend who has the game never gets on. But this problem needs fixed asap! And I can't wait until the reviews for this game comes out. Here's to hoping for an average score of 85 or better! I can't wait to get it today. 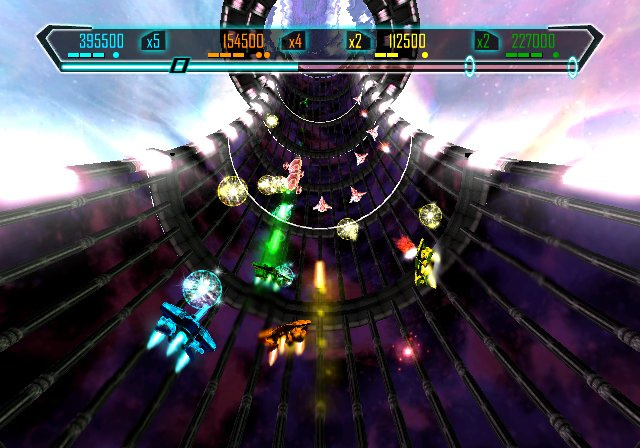 Gyrostarr looks like the Sonic 2 Bonus Level and Gradius had a child. Erm. Not sure I want to take a picture of it, let's intersperse text frames in the middle of the video so people don't get too close a look at the kid. Be sure to rrun, rrun awayy from Gyrostarr! Somedays I just feel like a Geek and Otaku. And yes, I agree. Can't speak for Gradius though. Sonic 2's Special stage = Second best special stage ever! I'm glad you found that comparison. It's gonna make me enjoy GS even more. Looks like an instant download to me! Not to join the chorus, but man! I have only 9 blocks left and still have to get Brawl later this week. What the hell am I going to delete now?! Geesh. I sure hope someone mailed Jeff Minter a check or some WiiPoints or something for this one. Please keep the topic on Gyrostarr guys. There are news posts to moan about the shortage of storage on your Wii in! This is just another "Shooter" that developers can quickly conjure up out of the ashes. Why can't they just develop new ideas, and concepts out of the monotonous "Sci-Fi" genre? I will not download this game, as it is just another repetitive shooter that amoung other things, takes up 290 blocks of my valuable space. Peeps, just wait for SMBRPG, Earthbound or Bomberman. This aint worth the 700 points. ECM provided convincing arguments for saying that the game may in fact not be worth a purchase, however, you don't seem to provide enough support that the game isn't worth it. Of course everyone's entitled to their own opinion but I like hearing negative comments about games at times just to see why people say the things they do. First off, I don't get how this ISN'T a new idea? So fun! The controls are not a problem; you just might need a little time to get a completely comfortable feel of them. The bonus levels are where it could be hard to maneuver, but that's because they're so fast and you have to really work to keep up with them. The game is great! And I recommend you all buy it! The hype was definitely worth it! Ouch...I don't have enough blocks. Ocarina of Time took up more space than I thought it would... The game looks fantastic though. marvman, what is wrong with you? The game is very much new and not repetitive at all, and that is a fact that you cannot dispute. 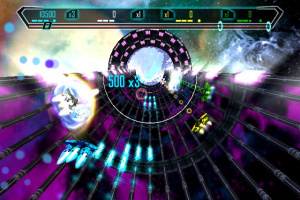 In the game, you tilt the Wii Remote or use the control pad or Wii Remote + nunchuk to move around and shoot enemies and collect energy on intense, fast-paced space tracks. In the atmosphere it takes place in, and with the gameplay and objectives, it's not something you see every day. If you want to wait for only SMRPG or Earthbound, you'll be disappointed. And since you haven't even played the game, you have no idea what you're trying to say. You have no room to talk right now, so I suggest you leave. I've just been playing this for the past hour and on the whole I have mixed feelings about it. I will say upfront I do not feel that this game will appeal to everyone, however it is still good fun. Unlike some other commenters, I do not see any online scoreboards. Just 'factory' preset scores which you have to try and beat like an old arcade game. I find the controls were really easy to pick up, and to me the framerate seems pretty smooth (I am not going to get into the whole 60 FPS debate!). Things do get a bit mental on the bonus stages, so I wouldn't recommend this to epileptics! I am only up to level 10 at present, so I am not qualified to give a fully informed verdict yet, but I will say I am already finding the gameplay a touch repetitive. There seems to be a distinct lack of challenge and you can shoot the other ships, dodge bullets, use the grapple and collect energy pretty much on auto-pilot. I don’t want to sound too down on this because I haven’t tried the multiplayer options yet, and there is no denying that it is fun in short bursts. This is old-skool twitch arcade gaming. You have to react quick and hold onto your score multiplier. I am going to persist with it, I love games like Tempest and this has the same addictive pull for me. Something still hasn’t really clicked for me with this game yet however, so I honestly cannot say if the hype was justified. this game is great. and how can you say this idea isn't new? it is completely new. SO Torn! I have room if Dr Mario demo and something else dies, but I am torn! it is worth it, trust me. I'm starting to get rather annoyed that Europe haven't got this yet. I have tried to be patient with this. We still haven't even got V.I.P Blackjack. HVS better not be deliberately neglecting Europe. COME ON HVS!!!! GET ON WITH IT ALREADY! How much longer does the uk have to wait for this. Don't you dare rub it in Samus2008. Well, I thought it looked a bit familiar! This is the least played game on my system. I don't even have it on it anymore. It was fun for about ten minutes and then became super repetitive. I is way boring unless you like doing the same things over and over again. I give this game a 3/10 and not worth the money. I still hold the top online score on this game! News Gyrostarr Hits WiiWare This Monday! News ESRB Update: EarthBound Finally Coming To Virtual Console!